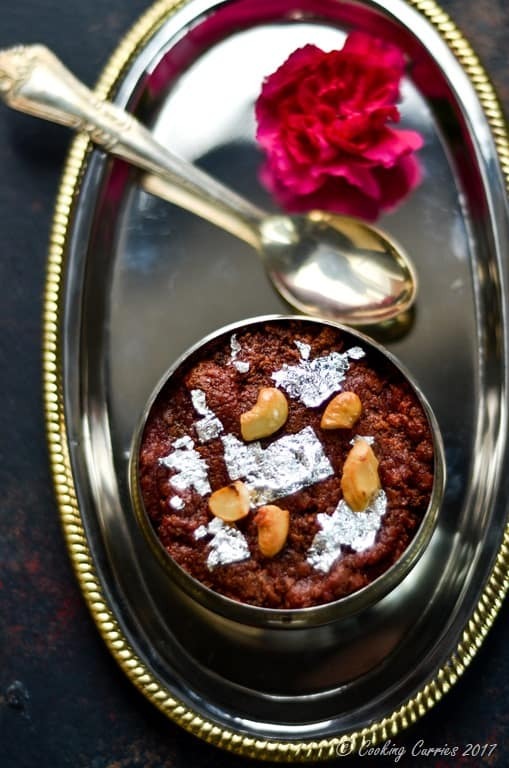 You won’t feel guilty with this indulgence of Beetroot Halwa / Indian Style Beet Pudding with Condensed Milk, as it is filled with all the goodness of beets, yet so very decadent. 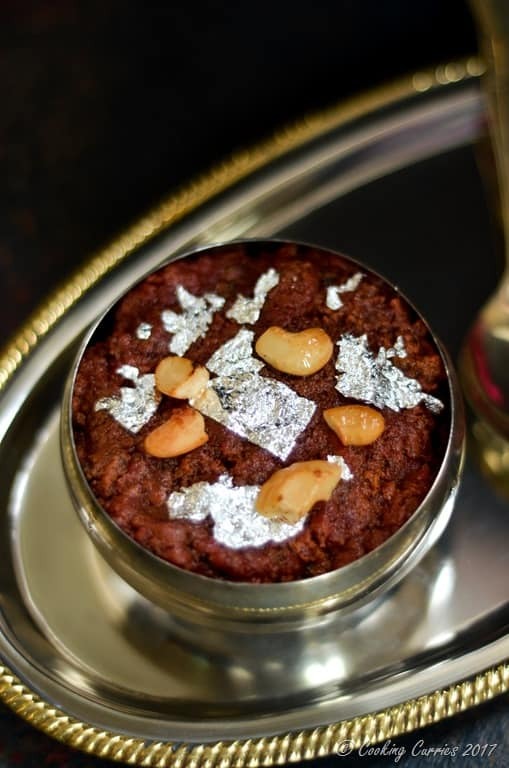 There was this phase some time in the 90s, I think, where Beetroot Halwa was the new craze at all weddings! South Indian weddings sometimes try to be a little “hip” by having Northern Indian desserts in their party dinner buffets. For the longest time, Carrot Halwa and Vanilla Ice Cream was the combo that everyone loved. But that was overdone, as with anything else and at one point of time, I just couldn’t stand it anymore. 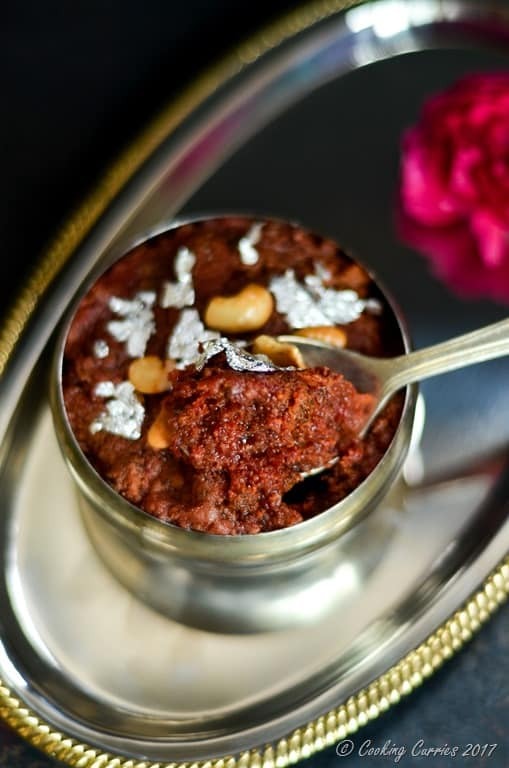 Then came the phase of Beetroot Halwa, where it was somehow deemed a little more healthier, which I don’t know why anyone would think of that as a highlight for a wedding feast. So anyway, I have had my share of beetroot halwas and I wished for the overdone Carrot Halwa phase. I have never really had a good beetroot halwa that did not taste like a vegetable dish with a sprinkle of sugar and dollop of ghee on it. To be fair, maybe this is something that is hard to get to be decadent if made in large quantities. I don’t know what it was, but I swore I will never make or eat Beetroot Halwa again. Last week, I grated an entire large beetroot, only to realize that it was quite a lot for the simple raw beet raita that I was planning to make. Since I had all that grated beet sitting there, I challenged myself to make a good beetroot halwa out of it. 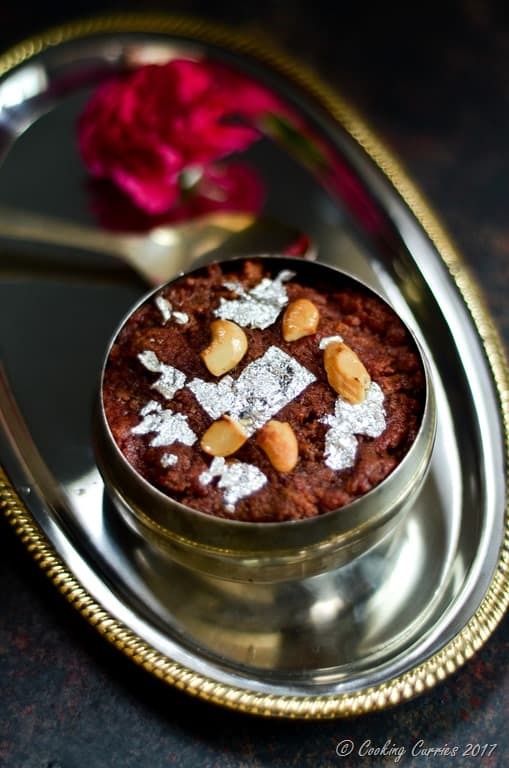 My initial plan was to make it with khoya / milk solids, so it also gets a peda (an Indian dessert made with Khoya) like feel to it. But I didn’t have any khoya on hand and decided to go with the condensed milk route of how I make carrot halwas. Though, my most favorite and easy way to make carrot halwa is to make it in a pressure cooker – here is the recipe for it. So, I, very skeptically, embarked upon the process of making beetroot halwa. I really did not want any of the raw beet flavor in it, so I cooked the heck out of it in ghee, till the beets almost caramelized by itself. Then I added condensed milk and kept cooking it, till it became a little thicker in consistency that the usual halwas you would find. Like I said earlier, I wanted a little bit of that peda feel to it as well. Anyway, these two steps worked and if I may say so myself, I made a pretty decadent, non-raw-beet flavored Beetroot Halwa. The husband loved it too! So that says something about it. I hope you try it too and love it as much as we did. Heat the ghee in a heavy bottomed pan and add the cashew nut bits to it. Once they turn golden brown, drain them out from the ghee and onto a bowl. In the remaining ghee, add the grated beet. Over medium heat, cook the beets, stirring continuously. Once the oil starts leaving the sides of the beets and the beets have a sweeter caramelized scent to it, add the condensed milk. Be careful as it may splash. Keep stirring and cooking the beets in condensed milk, till it all comes together and the ghee starts leaving the sides of the halwa in the pan. Cook for a few more minute, don’t stop stirring, over low heat and remove from heat. Move to a serving bowl, top with fried cashews and the edible silver flakes . Serve warm. 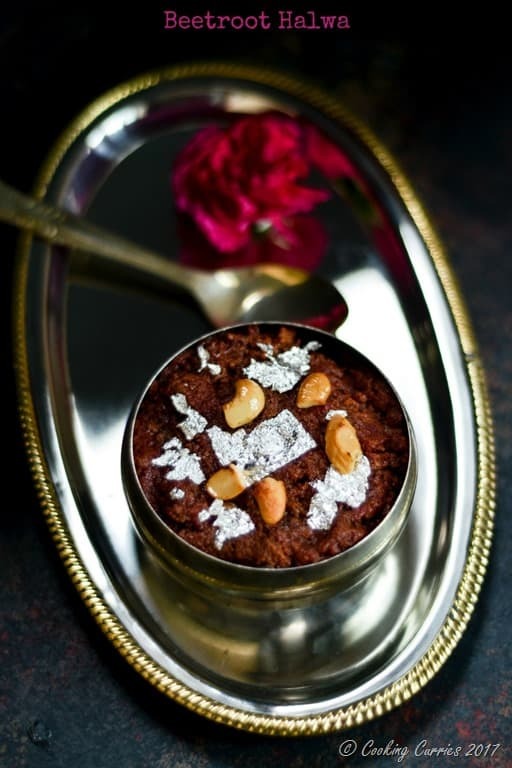 You won’t fell guilty with this indulgence of Beetroot Halwa / Indian Style Beet Pudding with Condensed Milk, as it is filled with all the goodness of beets, yet so very decadent. I would never have thought to put beets and cashews together, but this sounds and looks delicious! What a fascinating recipe! I bet its delicious! I have been doing this for halwa for almost 1 year during different occasions in my office. Instead of sweetened condensed milk, I use regular cow milk and add sugar to it as per my requirement. Sure! That’s another option too. This just gets done faster than that, as I’ve written in the blog post. Thanks for the input. This is a totally unexpected thing to do with beet root, but it sounds absolutely delicious! Thank you Chaitra ? and thanks for stopping by!